Manuel de Falla: "Nights in the Gardens of Spain"
Verbier Festival: Achúcarro the poet. "The audience has lived a very emotional moment. [...] At 81, the Spanish pianist is one that possesses magnificent sonorities. He played the Schumann Fantasy with contained passion. His Granados and Ravel breathe the warmth of this generous soul and a his lifetime experience. He played four encores, with an admirably played Scriabin Nocturne"
"It was a delight to hear piano sonority for once with such a warm and clear and intimate bloom"
"Achúcarro used his fine strength and technical sovereignty to achieve perfect unity with the orchestra"
"The purity of his sound [...] Strength, modesty and responsibility of a great artist"
"Joaquín Achúcarro: One of the Greats"
"Achúcarro's superb performance closes in Beauty the concert series at La Fenice"
"He drew from the piano all the singing quality of the instrument"
"With a dazzling technique and an exquisite poetical sensitivity Achúcarro mesmerized the public"
"Achúcarro is the consummate artist"
"Pianist Achúcarro plays pure magic"
Even though he made his debut at age 13, his professional career started after his victory at the 1959 Liverpool International Competition (one year after Zubin Mehta had won it as conductor) with Schumann's Piano Concerto and Rachmaninoff's Paganini Rhapsody, which led to his London debut with the London Symphony Orchestra. He has since worked in 61 countries, performing in venues such as Avery Fisher Hall, Berlin Philharmonie, Carnegie Hall, Concertgebouw, Kennedy Center, Musikverein, Royal Albert Hall, Salle Gaveau, Salle Pleyel, Teatro alla Scala, Suntory Hall, Sydney Opera House, Teatro Colón and The Barbican both playing recitals and as soloist with 208 orchestras including the Berlin Philharmonic, New York Philharmonic, London Symphony, New Philharmonia, London Philharmonic, Chicago Symphony, Los Angeles Philharmonic, Dallas Symphony, City of Birmingham, Royal Scottish, National de France, RTE Dublin, Yomiuri of Tokyo, Western Australia, RIAS Berlin, Hamburg, Stuttgart, Dusseldorf, Santa Cecilia Roma, La Scala Milano, La Fenice Venezia, Orquesta Nacional de Espana, etc. 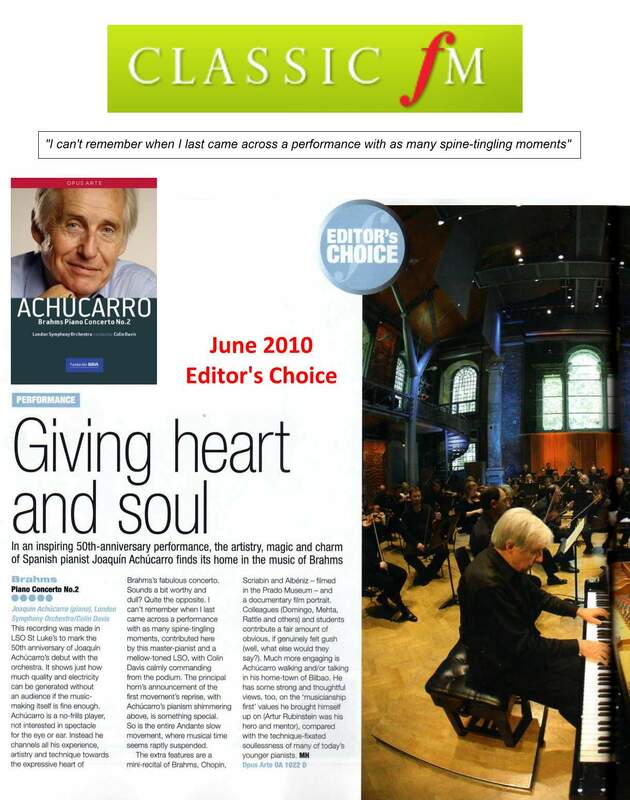 He has worked with 366 conductors such as Claudio Abbado, Sir Adrian Boult, Riccardo Chailly, Sir Colin Davis, Zubin Mehta, Sir Yehudi Menuhin, Seiji Ozawa and Sir Simon Rattle. 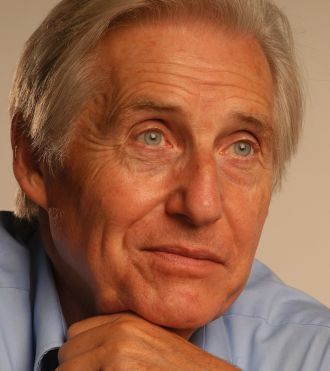 As a conductor-soloist he has worked with orchestras in Great Britain, Germany, Italy and Spain. In his home country, Spain, he has achieved the two highest honors in the Arts: in 1992 the Spanish Government awarded him the Premio Nacional de Música, and in 1996 he was knighted by King Juan Carlos with the Gold Medal of Fine Arts. He is also Comendador of the Order of Isabel la Católica and Member of the Real Academia de Bellas Artes de San Fernando. In 1997 he was awarded the Premio Larios for Musical Excellence, and he played at the inauguration of the Bilbao Guggenheim Museum in front of an audience of 25,000 and broadcast live in over 100 countries. UNESCO named him "Artist for Peace 2000" in recognition of his "extraordinary artistic achievement", and in 2003 he received the Great Cross of Civil Merit from His Majesty King Juan Carlos. "The piano is a percussion instrument. Some extraordinary pianists, and Joaquin is one of them, can make it appear that the piano goes legato and that the notes grow into each other... there is a very particular sound that he can make that now very, very few pianists can make. 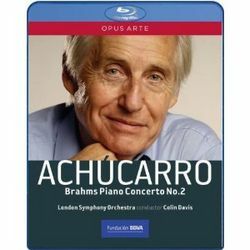 It's a very rare thing and it's instantly recognizable"
In 2010 Opus Arte has released the DVD/BluRay “ ACHUCARRO plays BRAHMS” with Brahms Piano Concerto n.2 with Sir Colin Davis and the London Symphony, plus a recital at the Prado Museum and a Documentary about Achucarro´s life, with comments by Sir Simon Rattle, Placido Domingo, Zubin Mehta and Lucille Chung. 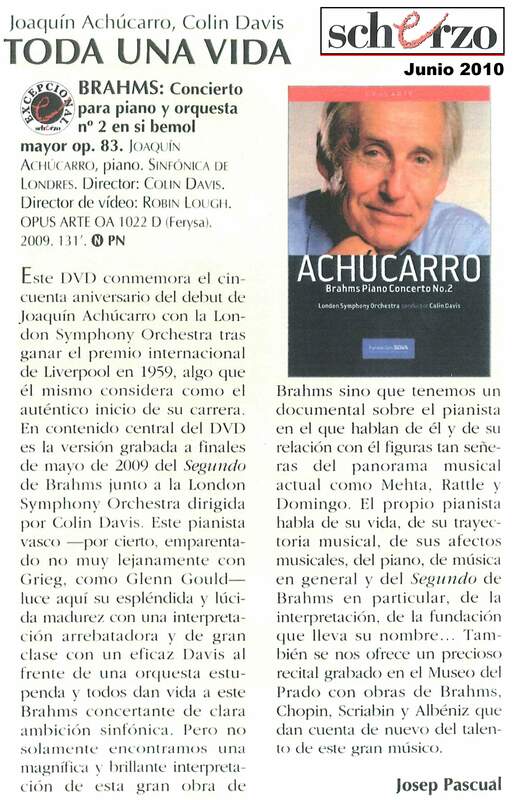 The success has been immediate, the DVD has received rave reviews and 5 stars all over Europe being “Editor´s Choice” in CLASSIC FM Magazine and rated “Outstanding” by INTERNATIONAL RECORD REVIEW and immediately climbed to the top of the Bestsellers and Hot New Releases charts in Amazon.com. 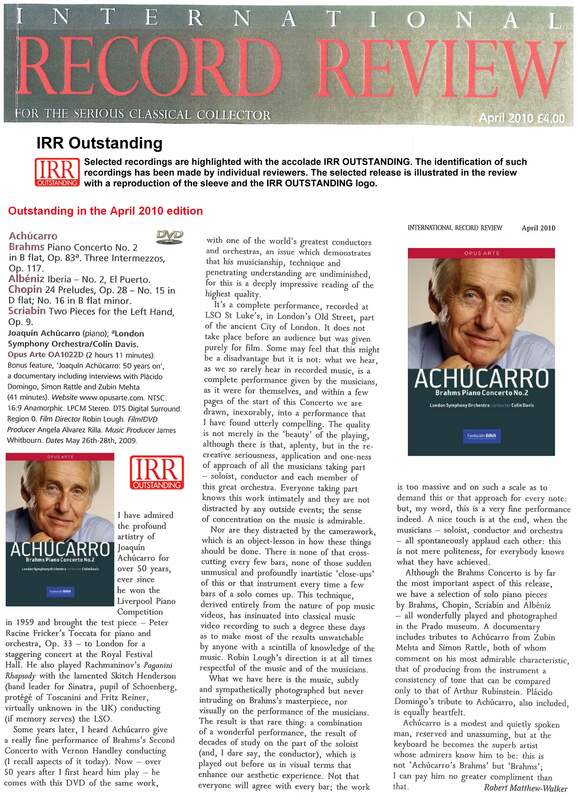 In 1997, following the express wish of the composer, Joaquín Achúcarro completed and recorded (for SONY Classical) his revision of Joaquín Rodrigo's Piano Concerto. The recording adds to his wide-ranging discography which includes works by Beethoven, Brahms, Schumann, Schubert, Ravel, Debussy and Mussorgsky, and prize winning discs of Granados' Goyescas, and the piano works of de Falla. His RCA recording of Nights in the Gardens of Spain with the London Symphony under Eduardo Mata was released recently for the third time. His latest audio recordings include Schumann's Kreisleriana op.16 and Fantasie op.17 under the Ensayo label, and also his 1980's live recordings of Bartok 2nd Piano Concerto and Rachmaninoff's Paganini Rhapsody with the RTVE Orchestra under Gomez Martinez. With Claves Records he has recorded Ravel´s two piano concertos, with the Orquesta de Euskadi under Gilbert Varga. Under the Ensayo label, additional recordings include La Nuit, a Brahms recital and a Ravel recital, which includes his highly acclaimed performance of Gaspard de la Nuit. Since September 1989 he holds the specially endowed Joel Estes Tate Chair at Southern Methodist University, Dallas, Texas, adjusting his teaching periods to his busy concert schedule. He is also a Professor at the International Summer Courses of the Accademia Musicale Chigiana in Siena (Italy). Nevertheless he remains an enthusiastic student, striving to make his first class technique as inconspicuous as possible in serving the cause of Music, exploring the infinite possibilities of sound of his beloved instrument.